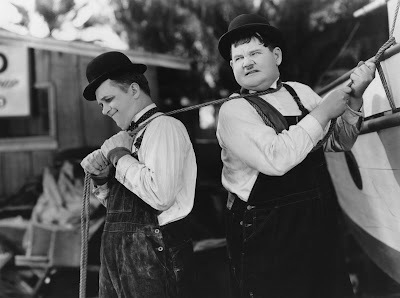 Today, I'm celebrating Labor Day with an article about old Hollywood's two favorite working stiffs, Stan Laurel and Oliver Hardy. Above, the boys are a pair of inept fishermen in Towed in a Hole (1932). Old Hollywood films feature many workplaces from the New York Daily Inquirer in Citizen Kane (1941) to the New Jersey docks in On the Waterfront (1954). Labor-related plots always had great comic possibilities, and most of the golden age comedians made some type of work movie during their careers -- Harold Lloyd dangling off the clock tower in Safety Last! (1923); Charlie Chaplin vs. the machine in Modern Times (1936) -- but nobody tried and failed to earn a living quite as spectacularly as the comedy team of Stan Laurel and Oliver Hardy. The thin one and the fat one played fishermen, flying aces, and furniture movers during their two decade career. They were equally terrible at all their chosen careers, getting into one "nice mess" after another with the predictable results of Ollie fuming and Stanley breaking down in childlike tears. Laurel and Hardy wouldn't stand a chance of gainful employment in today's job market of LinkedIn profiles and "networking." Still, their dogged determination to earn their daily bread is an inspiration to all of us who are working for a living. With that in mind, Here's four of their best films for your Labor Day (or any day) viewing pleasure. Laurel and Hardy were both contract players at Hal Roach Studios when they were teamed for a 1927 short called Putting Pants on Philip (Hardy plays the exasperated uncle of a kilt-wearing Scottish Lord played by Laurel). The duo gradually developed their comic personas and by 1929 they were a popular comic team. 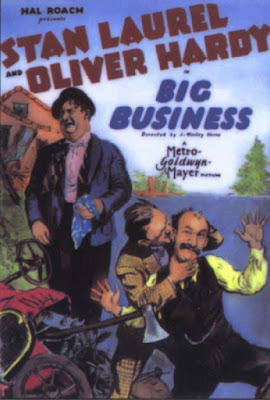 Big Business is a silent short that features the boys as door-to-door Christmas tree salesmen who get in a battle with their frequent screen nemesis, James Finlayson. Available on DVD. Laurel and Hardy easily made the transition to sound films. Their first full-length talkie, Pardon Us (1931), was a huge hit. The next year, Laurel and Hardy made the short movie, The Music Box, which is still probably their best known screen effort. The boys play a pair of furniture movers who try, fail, and try again to push a large piano up a huge flight of stairs. The clip above shows the shooting locations for The Music Box. Available on Video on Demand from Amazon Instant Video or on DVD. Towed in a Hole (the title is a play on words for a popular English sausage dish) features Stan and Ollie as fishmongers who are actually doing quite well for themselves when they Stan comes up with a bright idea (if you're not familiar with Laurel and Hardy this is always a bad sign). Available on Video on Demand from Amazon Instant Video or on DVD. 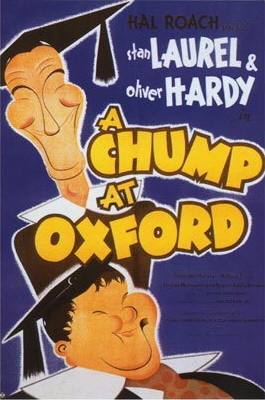 There's a lot plot in A Chump at Oxford, but the first 20 minutes, which is a recreation of the duo's silent short From Soup to Nuts, is pure comedy gold. Stan and Ollie are down to their last $6 so in desperation they accept a job as a maid and butler for a high society lady (Laurel's in drag). The result is an hilarious dinner party that devolves into chaos. Available on Video on Demand from Amazon Instant Video or on DVD. One thing Laurel and Hardy always pulled off was a musical number, so I'll leave you with "Shine On, Harvest Moon" from Flying Deuces (1939). Happy Labor Day! How delightful to spend part of the holiday with The Boys. You have inspired my viewing for the evening. Thank you.